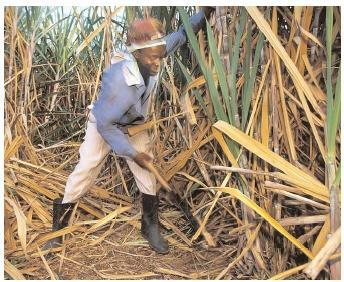 The ancestors of many Caribbean islanders were brought as slaves to work on the sugarcane plantations. In the New World, their traditional African cuisines integrated new flavors both from their new environment and from the cuisines of various European colonial powers. large scale. Coffee also began to flourish. Many of the islands had wild pigs and cattle on them, and spiced, smoked meat became part of the diet . Today, jerk meat is a specialty. A variety of fruit beverages are often served in the Caribbean. Beverages include green tea and "bush tea," served sweetened with sugar or honey, with or without milk. Bush tea is an infusion of tropical shrubs, grasses, and leaves that has a number of medicinal uses. People drink it as a remedy for gas, the common cold, asthma , high blood pressure , fever, and other ailments. Sweetened commercial drinks made from carrot, beet, guava, tamarind, and other fruits and vegetables are also popular. The health administrators of the Caribbean region are concerned with the rise of iron-deficiency anemia in pregnant women and school-aged children due to inadequate iron intake and poor absorption . The increased incidence of diabetes , hypertension , coronary heart disease , cancer , and obesity , especially in the thirty-five-and-over age group, is thought to be directly linked to the existing lifestyle and dietary practices of the islanders. 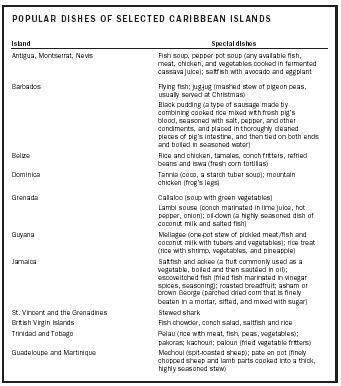 The Caribbean Islands have seen a proliferation of fast-food restaurants, and the increased consumption of meals high in fat , sugar, and salt has contributed to the increase in chronic diseases. In addition, there has been a reduction in the amount of cereals, grains, fruits, vegetables, tubers, and legumes that are eaten. The popularity of fast foods among the young has led the government to focus on improving nutrition in the schools. Also contributing to the health problems is the dependency on costly imported processed foods that do the body harm. Overconsumption of imported foods high in fat and sodium has led to a deterioration of the health status of people throughout the region, with an increase in health problems such as obesity, diabetes, hypertension, cardiovascular disease, and cancer. Adequate nutrition cannot be achieved without the consumption of sufficient foods containing a wide array of nutrients . Poor health status, whether as a result of insufficient food intake, overconsumption, or nutrition imbalance, threatens longevity and increases health care costs. The challenge is to improve the availability of nutritious foods and the eating habits of the varied population. SEE ALSO Africans, Diets of ; African Americans, Diet of ; Dietary Trends, International ; Fast Foods .